This is the first post in my new “100 Days of Real Food Tips” series. Enjoy! *Easiest to spread when the tortilla is warm…don’t forget the fun toothpicks! Top with all the usual sandwich fillings or use two crackers to make little sandwiches. Any of these options would be a fun stand-in for the typical sandwich bread. The waffles and banana bread would be especially delicious with some plain or flavored cream cheese in the middle. 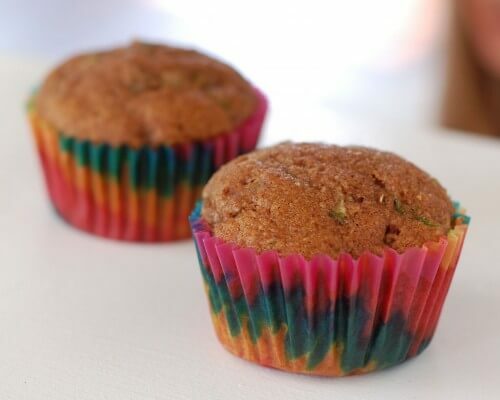 Forget a sandwich all together and send in some homemade whole-wheat muffins – like zucchini (pictured) or blueberry – in place of bread. Most muffins can be made in advance and pulled out of the freezer the night before school. When I brought home a little plug-in donut maker (similar to a waffle maker) from Target my husband said, “Oh great, another appliance to find room for.” But my children devour these little donuts and feel like they’re getting an extra special “treat” so I think it was well worth the purchase. You can also make an extra big batch of these mini-donuts and freeze the extras for later. If you buy one try this recipe for 28 donuts: 1 cup whole-wheat flour, 3 tsp baking powder, 1 egg, 1/2 cup milk, 1/4 cup pure maple syrup, 1/2 teaspoon vanilla, 4 tablespoons oil (I used coconut oil). 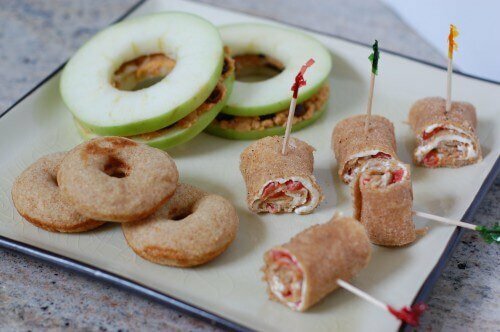 Incorporate fruit and cheese that you know your child likes as well as one new item. Everything is more fun on a stick! This is much faster than making regular pizza from scratch and just as delicious. 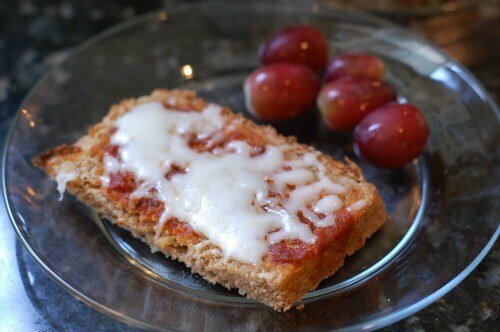 Simply top regular whole-wheat sandwich bread with sauce and cheese then pop it in the toaster oven….and voila! A Thermos is a great way to switch things up when it comes to packing lunch. Try soups, oatmeal, brown rice or whole-grain pasta dishes, and leftover dinners. I’ve been talking about these reusable freezie pop holders for a while now, but I love them so much I just couldn’t leave them off the list. I fill them with everything from smoothies to plain yogurt mixed with homemade berry sauce to store-bought applesauce and then stick them in the freezer. 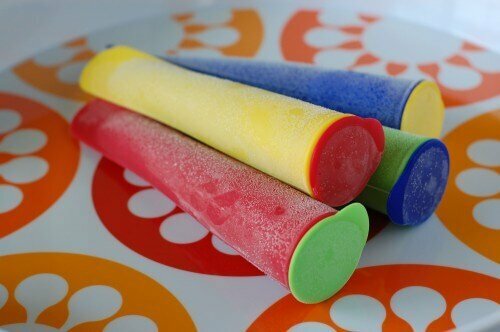 They are usually semi-frozen by the time my daughter eats lunch at school and she devours them every time! If you have any other fun lunch ideas you’d like to share please leave them in the comments below. Previous Post: « Announcement: “100 Days of Real Food” Tips! Mix together and chill in the refrig and then use. Your kid lunch ideas are great! I also pack lunches for myself and my husband regularly. I often take leftovers that I can heat, but that’s not possible for my husband who is always on the road. He’s also not thrilled when I pack things in a thermos because he says they’re luke warm at best by the time he gets to them. I’d love some other ideas for him other than sandwiches. Unfortunately, muffins, cold pizzas and cheese and crackers don’t really cut it for my husband who is constantly on the go! Trying filling your husbands thermos with boiling hot water before adding his lunch to it. This way your container is hot before adding the food. It works for me every time . Thank you, I’ve tried that, but he still complains about it not being warm enough! What brand of fruit spread do you use or would you recommend? I can’t seem to find one without sugar and am open to suggestions. The best I can find is the Smuckers all natural. They have one made with just fruit juices. I think it is smackers. Read the label. There are several on the same shelf made with only juices.